Kobe Bryant headlined the biggest act in Las Vegas on Sunday night. Bryant, Carmelo Anthony and the West high rollers lit up the Strip with their own version of Showtime, romping past LeBron James and the East 153-132 in the NBA All-Star game. "I think we had a little flair, a little Vegas in there," West forward Shawn Marion said. "Hopefully the fans enjoyed it a lot." When the showgirls, acrobats, magicians and Elvis impersonators were finally done, it was Bryant who heard the loudest cheers, as fans chanted "MVP!" "MVP!" in the closing minutes. "To have this type of reaction here in this All-Star game is very humbling," Bryant said. "I just feel very blessed and very fortunate to be able to come out tonight and put on a really good show." Bryant scored 31 points, had six of the West's record 52 assists and was selected the MVP. Amare Stoudemire added 29 points for the West, which quickly built a big lead and held it this time, a year after blowing a 21-point cushion in a loss in Houston. An event that some locals called the biggest thing fell a little short in the basketball department _ the West had a large lead for most of the final three quarters _ but that didn't seem to matter to the fans or the players. "We got here at 2 o'clock," the East's Shaquille O'Neal said. "There's a lot of stretching and standing around. We were all kind of stiff, so the game was a little lopsided. But that's OK, they came here to see a show and they got a show." And the players agree with Las Vegas officials that the game should come back here _ whether Las Vegas ever gets an NBA team or not. "If they don't do it here every year, they should at least have it here every other year," East guard Richard Hamilton said. Anthony, a late addition to the team, scored 20 points and Marion, who played at the Thomas & Mack Center at UNLV, added 18. Tracy McGrady had 11 assists to help the West snap a two-game losing streak. James scored 28 points for the East, and Dwight Howard had 20 points and 12 rebounds. The East barely shot 40 percent through three quarters in a game that isn't known for its defensive intensity before a late flurry during garbage time. "It all comes down to is who plays with the most energy and it was the West with more energy, especially in the first half," Dwyane Wade said. Wade had only 10 points on 5-of-12 shooting, but he had reason to be tired after hosting events Thursday and Friday night. Those were two of the many functions that kept the players out until all hours of the night. 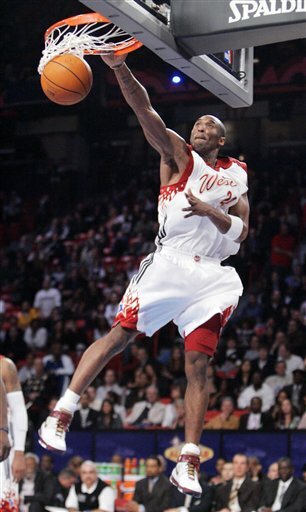 Still, the game was secondary to the show in this most unusual of All-Star games _ and it was quite a show. With tickets unavailable to the public, brokers were asking more than $20,000 for a top seat. Jay-Z, Beyonce, Diddy, Prince, Eva Longoria and Adam Sandler were among those who scored spots in the front row, and Christina Aguilera and Toni Braxton performed at halftime. The event started with a celebrity red carpet, where Las Vegas Mayor Oscar Goodman, flanked as usual by his showgirls and backed by entertainer Wayne Newton, vowed again to get the NBA here full-time with a new arena to play in. Magicians Siegfried and Roy then welcomed the fans to Las Vegas, before introducing the showgirls who escorted Newton out to the stage for a performance of "Viva Las Vegas." After the East All-Stars were introduced, Newton took the stage again for another performance before the West players were announced. After another Las Vegas entertainer, Danny Gans, sang the national anthem, it was finally time for some basketball _ after about a 45-minute pregame. Perhaps that took its toll on the players. There were missed dunks and passes thrown out of bounds by both teams, but the East was by far the worst. They missed seven of their first nine shots, including a blown dunk attempt by Shaquille O'Neal. James later almost injurehimself when he tried to throw himself a pass off the backboard and tumbled over another player, and Jermaine O'Neal appeared to tip in a basket for the West. A first-quarter timeout brought out some performers from a show at the Tropicana, but there was a serious moment at the end of the period when Bill Russell was among the former Boston Celtics who took the court with the daughter of Red Auerbach, who died last year. The West led 39-31 at the end of one, and quickly pushed that lead into double digits in the second quarter _ Shaquille O'Neal missed another dunk during that stretch. The lead ballooned to 23 when Bryant nailed a 3-pointer and followed with a dunk on the next possession, and the West was up 79-59 at halftime. "The West came out tonight on fire," Howard said. "The West has got a lot of great shooters, the East has mostly big men." Bryant had 17 points at halftime and Anthony added 12. James scored 16 for the East, but none of its other players was in double figures. The East climbed out of a 21-point deficit to win last year's game in Houston, but didn't show nearly the fight this time. Stoudemire fueled a 10-0 run that made it 95-65 with 8:20 remaining in the third quarter, and the West was up by 31 heading to the fourth.